Solar Control Window Films Market size was valued at over USD 640 million in 2015 and is forecast to expand at over 11% CAGR up to 2024. Increasing global efforts to reduce carbon foot print is forecast to positively impact product demand in residential and commercial buildings. Booming construction sector, particularly in Asia Pacific and Latin America is likely to drive global solar control window films market size from 2016 to 2024. In recent years, countries such as Indonesia, China, Malaysia, Singapore, and South Korea owing to high business potential of have become the major hosts for national and international events, which has resulted in increased product demand in hotels, shopping malls, high rise buildings, arenas, and stadiums (both outdoor and indoor). Chinese construction spending was over USD 1.7 trillion in 2015 which is forecast to positively impact growth. A key challenge faced in residential sector is to restrict additional incoming sun rays and to provide privacy at night as well. Traditionally, these films were used to allow high solar rejection rate. However, technology innovation has facilitated clear visibility form inside during both day and night which may boost product demand. These films are constructed with clear and distortion free adhesives systems and scratch free coatings, allowing easy maintenance and cleaning. Additionally, they provide enhanced safety by forming a shield across glass and keep the fragments of the broken glass in place in case of any breakage. Also, these films are used to improve the unprotected glass and enhance its quality up to certified safety standards for impact by objects and humans, blast protection, such as from a chemical explosion. Furthermore, they also help by protecting property against fading caused by the UV rays, which consequently improves comfort by solar control. Growing adoption due to rising environment and health concerns is anticipated to be key propelling factor over the forecast timeframe as it restricts carbon emissions. Residential, commercial, and industrial sectors are initiating steps to decrease the overall energy consumption. Air conditioners are prime energy consumers due to improved consumer lifestyle coupled with high per capita disposable income. Additionally, over 1 trillion KWh of electricity is consumed by the automotive heating, ventilation, and air conditioning systems. These films block over 80% of solar energy which results in saving above 30% of utility bills by lowering heating and cooling costs. Furthermore, the industry has witnessed government support to decrease carbon footprints. For instance, India has proposed to cut down its carbon emissions by over 30% by 2030. Growing smart glass demand which helps to reduce the cost for lighting, air conditioning, curtains, blinding or heating of the room, this may be an alternative product threat which may act as a restraint for solar control window films market. However, high smart glass price over ordinary glass may restrict smart glass acceptance. Furthermore, regardless of window films benefits, market growth is negatively impacted by technical, installation, and warranty challenges. Construction application was valued over USD 370 million in 2015. Widespread glass application across construction to enhance the appearance and increase the indoor lighting of the interiors may propel demand up to 2024. It also finds application in retail stores to attract customer by providing added clarity and gloss. Automotive application is projected to expand with over 11% CAGR in revenue. Vehicles during day time are widely exposed to sun light substantially increases the inside temperature and causes extra load on the air conditioning system which later affects the fuel consumption. These films help in maintaining the temperature inside was reflecting UV rays. 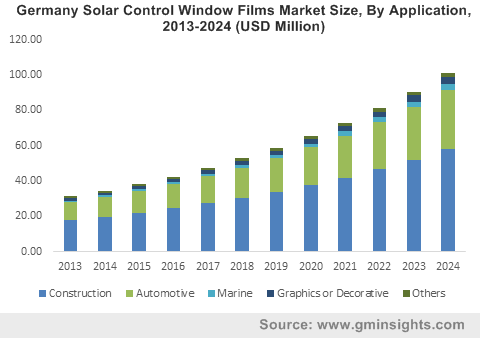 Booming automotive industry may positively impact on solar control window films market size. Marine application is projected to surpass USD 110 million by 2024, with estimated gains over 11% CAGR. Ships during sail are exposed to harmful radiations from sun. Window film may prevent headache, cellular phones, audio instruments, maritime electronics from harmful UV rays. Clear (Non Reflective) type solar control window films market was valued at over USD 175 million in 2015. Non reflective clear film has advantage owing to its ability to substantially reduce passage of ambient light when coated on both sides of the window surface. These films can be applied on multiple surfaces such as smooth windows and large doors. Vacuum Coated (Reflective) market is anticipated to witness gains at over 11% CAGR from 2016 to 2024. These films when coated with reflective metal through vacuum coating process give impressive looks. Also, it offers high reflectivity and consistent coating which is likely to propel industry growth. Organic solar control window films market size is forecast to reach USD 240 million by 2024. Organic coatings are also used in safety films by using adhesives. These are thicker and gives protection against glass shards. However, organic molecules when combined with heat may stress the glass which may result in cracking. Metallic absorbers are forecast to expand at over 11% CAGR up to 2024. These are used as decorative and style statement for the end user. It significantly reflects sun rays which helps in reducing power bills due to ingress of lesser heat. North America, led mainly by the U.S. solar control window films market size, was valued over USD 155 million in 2015. Increasing health awareness coupled with rising need for energy savings in the region is forecast to drive industry growth. Asia Pacific, led by India and China, is forecast to reach USD 540 million by 2024. Growing construction and automotive sectors coupled with large scale urbanization in the region is anticipated to boost industry growth up to 2024. Europe solar control window films market share is set to gain steadily pver the next decade. Global solar control window films market share is highly consolidated. Major industry participants include Thermolite, Solar Control Films Inc., 3M, CPF Films, Llumar Window Films, Johnson Window Films, and Vista Windows Films. Other notable participants include Madico Inc., Eastman Chemical Company, Solamatrix, Pleotint LLC, Polytronix, and CHB Industries. These films find extensive application in commercial and residential buildings as protective sheet on windows to reduce carbon footprints. These films protect against damaging ultra violet radiations that may fade away fabrics, display articles. It acts a blocking glare which reduces heat within building and lowers energy costs by lowering air conditioning needs. Also, it provides privacy along with attractive appearance. They are manufactured primarily from polyethylene terephthalate (PET). These are used due to its excellent optical properties and strength.